The exhibition focuses on Gueorguieva’s evolving negotiation between surface as the material condition and location of the image. Gueorguieva uses line and color to intensify spatial ambiguities, undermining the relationship between figure and ground. 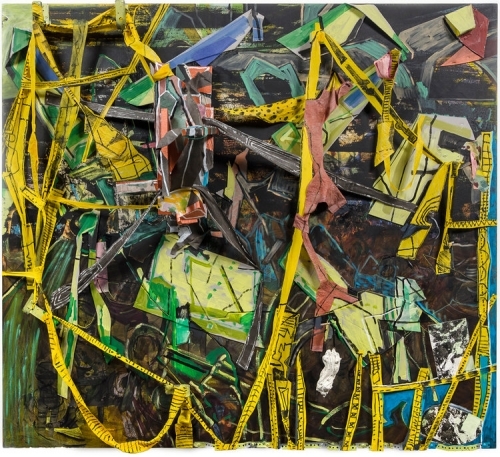 In the large construction “Bound”, a wide yellow line (both as painted mark and as collaged or free hanging dyed and hand painted muslin) traverses the entire field, stitching together disparate materials and creating a possible path for the eye, which never arrives at a static image. Everything keeps shifting. Gueorguieva asks repeatedly, “Where does the image occur, and how does one experience it?” She frees painting both from narrative and from abstraction, allowing process to evidence a succession of accumulation and removal, the accretion of marks and their burying below successive layers. With equal rigor she explores the shallow space between the pigment, the cut, the glued piece of muslin and the canvas; and the deeper space of built-out relief produced with the aid of steel, cardboard and wood. In the latter space layers push apart, allowing for the shallower negative spaces produced by the cut to become visible and palpable. The bodies of the work, painter and viewer are implicated in a choreography that intensifies the tactile condition of seeing and feeling. The absence left by the cut reveals the negation implied by the cut’s gesture. The cut line mimics the function of the contour line but instead of delineating form it depicts an abyss or empty space. The viewer is invited to see/feel their way over an edge and descend down to another space revealed by the cut. The journey is as much tactile as it is visual. The fractured surface evokes both a ruin and a structure under construction. This tension between dissolution and construction persists in Gueorguieva’s work addressing the act and process of making, but also more broadly to human existence in a turbulent, physical space.Iva Gueorguieva (b. 1974, Bulgaria) received an MFA from the Tyler School of Art in Philadelphia in 2000. Gueorguieva currently has a two-person show with Dona Nelson at Sophia Contemporary, London. 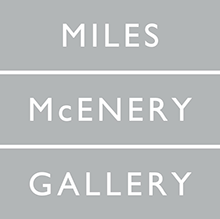 Recent solo shows include Ameringer/McEnery/Yohe; ACME, Los Angeles, CA; Susanne Vielmetter Los Angeles Projects, LA, CA; Fredric Snitzer, Miami, FL; Galerie Stefan Roepke, Cologne, Germany; Luther W. Brady Art Gallery, Washington, D.C.; Bravin Lee Programs, New York, NY; Samson Projects, Boston, MA; Stichting Outline, Amsterdam, Netherlands; Pomona Museum of Art, Claremont, CA. Notable group shows include “Variations: Conversations in and around Abstract Painting”, curated by Franklin Sirmans, Los Angeles County Museum of Art, LA, CA; “Making Sense: Rochelle Feinstein, Iva Gueorguieva, Dona Nelson, Deborah Grant” curated by Margaret Miller, USF Contemporary Art Museum, Tampa, FL; “Graphicstudio: Uncommon Practice at USF,” curated by Jade Dellinger, Tampa Museum of Art, Tampa, FL; “Desire,” Pasadena Museum of Art, Pasadena, CA. Her work is included in many public and private collections including the Los Angeles County Museum of Art, Los Angeles, CA; the Minneapolis Institute of Art, Minneapolis, MN; The Museum of Contemporary Art, Los Angeles, CA; University Art Museum | California State University, Long Beach, CA; Art, Design and Architecture Museum at UC Santa Barbara, Santa Barbara, CA; Pomona College Musuem of Art, Claremont, CA. She is the recipient of the Orange County Contemporary Art Collectors Fellowship for 2012, the California Community Foundation mid-career fellowship for 2010 and the Pollock-Krasner Grant for 2006.